North Koreans Go Back to Work at Nuclear Site – Coercion Code – "Dark Times are upon us"
SEOUL, South Korea — North Korea appears to have resumed work at its nuclear test site after a perplexing series of volleyball matches were held there, according to analysts who studied satellite images of the site, renewing concerns that a major weapons test could be imminent. Many observers had feared that North Korea would test a nuclear device at the site around April 15, the birthday of Kim Il-sung, the North’s founding president and the grandfather of the current leader, Kim Jong-un. But Mr. Kim’s government celebrated the day instead with a military parade in Pyongyang, the capital, during which a fleet of missiles were rolled out, including what analysts believed were never-before-seen long-range ballistic missiles. North Korea carried out a missile test on Sunday, but it was considered an embarrassing failure, with the projectile exploding immediately after liftoff. But North Korea is preparing to celebrate another major holiday this coming week: Tuesday will be the 85th anniversary of the founding of the Korean People’s Army, and the North often uses such occasions to show off its military advances. 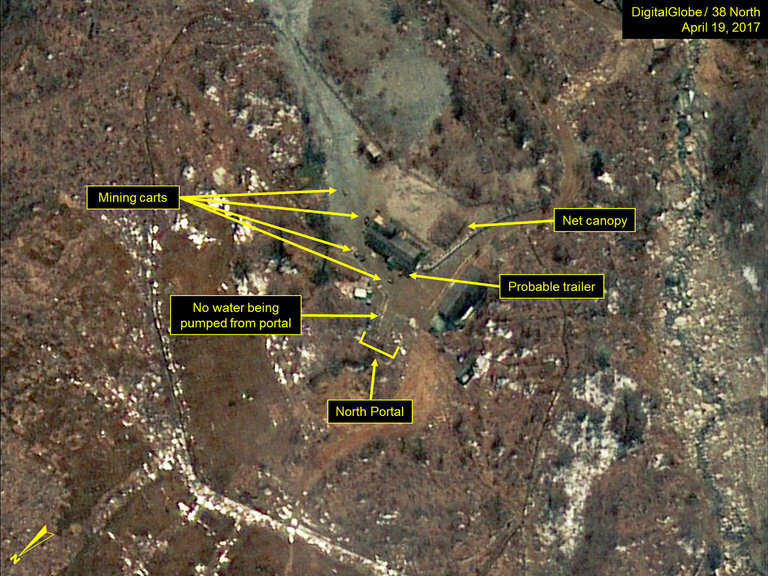 On Friday, the analysts Joseph S. Bermudez Jr. and Jack Liu posted new satellite images of the nuclear test site in Punggye-ri, in northeastern North Korea, on 38 North, a website affiliated with the Johns Hopkins University School of Advanced International Studies. From the commercial imagery dating from Wednesday, they noted what looked like trailers near the portal of a tunnel where they said North Korea appeared to have been preparing for a nuclear test, which would be its sixth. They also noted mining carts along the tracks leading to a spoil pile and a net canopy, presumably concealing equipment. The North Koreans appeared to have stopped pumping water out of the tunnel. In an earlier report, the analysts said this might mean that the tunnel had been sealed for a possible test. In their previous study of satellite photos, taken last Sunday, the analysts noted several teams at the test site playing volleyball, a popular sport in the North. That left observers wondering whether the North Koreans were engaged in some sort of deception — they are believed to know when commercial satellites that take such images will fly overhead — or were simply taking Sunday off. No one was playing volleyball in the images taken Wednesday. Mr. Bermudez and Mr. Liu said it was unclear whether the latest activity from Punggye-ri reflected a “tactical pause” before a coming nuclear test, a prolonged “stand-down” from testing or normal operations at the site. “Regardless, satellite imagery continues to indicate that the Punggye-ri nuclear test site appears able to conduct a sixth nuclear test at any time once the order is received from Pyongyang,” they concluded. On Saturday in Sydney, Australia, Mr. Pence said that an American naval strike group led by the aircraft carrier Carl Vinson was expected to be in the Sea of Japan, which borders the Korean Peninsula, by the end of April. Senior aides to Mr. Trump have said that military options are not off the table in dealing with North Korea’s rapidly advancing nuclear and missile technologies. Those remarks prompted fears in the region that the new American president might order a pre-emptive strike at North Korea’s weapons sites, which could set off a war. North Korea has conducted a series of nuclear and ballistic missile tests since 2006 as it seeks to develop a small, sophisticated nuclear warhead and an intercontinental ballistic missile, or ICBM, capable of reaching targets as far away as the United States. In a New Year’s Day speech, Mr. Kim said his country was almost ready to conduct its first ICBM test.